KeliWeb Review 2019: Is KeliWeb a Good Hosting? Keliweb is an Italian web hosting company that offers both Windows and Linux-based hosting. Their shared hosting plans offer robust features that make them great for beginners and experienced webmasters. Keliweb has been offering online hosting services since 2009 and has over 25,000 satisfied customers worldwide. They offer a variety of Linux and Windows hosting services with great features and an above-average SLA of 99.99%. Note that their shared hosting is for single domain hosting only, but with their range of cloud, VPS, and dedicated hosting they are an excellent choice for both beginners and experienced webmasters. Free migration tools will save you money if you need to move your website from another platform. While I appreciate that Ruby on Rails and CGI are offered, I would like to see Python and other tools supported. Note that some features such as cron jobs and anti-spam filters are not available on the Keli User plan. They are available on all other plans. With Keliweb you don’t need to be an expert to build your website. All plans come with a free website builder with which you can create a website with no coding knowledge required. 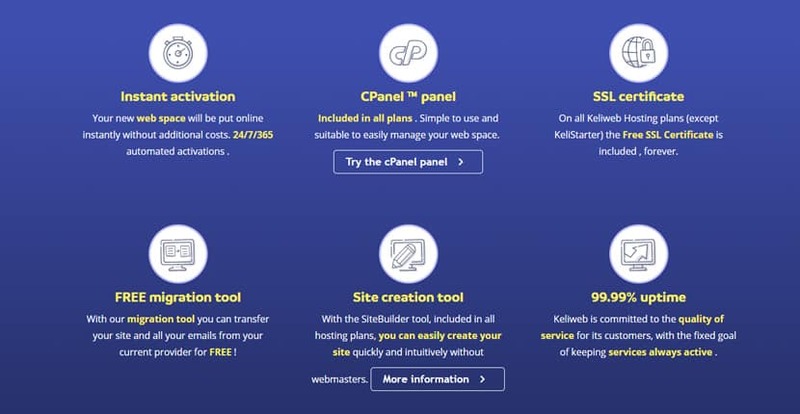 All plans but the basic Keli User plan also include the Softaculous auto-installer that will allow you to install WordPress, Drupal, and hundreds of other apps. As always, you can also use the industry-standard cPanel to build your website. As you can see, the Keli Pro plan is your best value, since the Keli User plan doesn’t come with SSD storage, nor does it include a convenient one-click app installer. Note that all plans come with a free SSL certificate, but the Keli SSL plan gives you a premium certificate along with five times the storage of other plans. Like Linux web hosting, all Windows hosting plans come with a free SSL certificate with the SSL plan offering a Premium certificate. Note that these plans offer a Plesk Onyx control panel rather than the basic cPanel you see with Linux hosting. Keliweb also offers optimized hosting for WordPress, Joomla, PrestaShop, and Magento. These plans come with the software pre-configured. Check out the website for more details, but note that you will pay up substantially for these optimized services. There’s one important caveat about this service. Email hosting storage is shared with your domain hosting. For example, if you have the Keli User plan and have 1GB in emails, then you only have 1GB left for your domain. Keliweb plans as a whole are inexpensive compared to other website hosts. However, you must sign up for a year’s service. They don’t offer monthly or quarterly billing. You can save even more if you sign up for two or three years worth of hosting with discounts up to 48%. Keliweb offers average support consisting of toll-free telephone support, live chat, email support, and ticket support for customers. Customer support has limited hours: it’s only available from 9:30 a.m. to 12:30 pm and 3 p.m. to 6 p.m. CET. Also, a few of their customer support services come with a fee. You can get basic assistance for free, but if you need more advanced support, such as restoring a corrupted database, you will have to pay an hourly fee. There is a robust FAQ and Guides section covering many basic and intermediate topics. If you have something that may require more than basic support, I recommend checking for an answer in the FAQ section before footing the bill for paid support. Outside of forcing you to pay for advanced support, Keliweb offers a great product that is an excellent choice for beginners and experienced webmasters alike. They offer robust features that make them suitable for personal and small business websites. Wondering how KeliWeb stacks up against other Web Hosting companies? Enter any other Web Hosting company and we will give you a side-by-side comparison.